It is easy to forget nowadays, with the ubiquitous and innovative explorations of the classical repertory provided by the admirable Naxos, that when that enterprise first appeared in the early 1990s it was far from being the only bargain label CD provider on the block. Many of the major record companies were quick to enter the field but their catalogues mainly consisted of reissues of analogue and early digital material which had already been available either on LP or full-price CD. There were other labels which released newly recorded material, many of whom aimed at markets outside the established record stores by making their product available in supermarkets, chain stores and filling stations. The first Penguin Guide to Bargain CDs in 1992 found enough of these to make a very substantial volume, and the short-lived Gramophone spin-off Classics magazine devoted monthly issues to surveys of their output. One of the most interesting of these early bargain CD providers was Pickwick Classics, who worked mainly with British or British-based artists to furnish a substantial catalogue of music both from the mainstream and also on the borders of the repertory. Unlike Naxos, who at that time were recording mainly with eastern European and Asian orchestras, their use of experienced British artists gave many of their releases a real edge in the market. The disappearance of their discs from the current catalogues is to be regretted. Here we have one of the more enterprising of those Pickwick releases originally dating from 1991 and now reissued on Nimbus Alliance, with new booklet notes by Jonathan Woolf. Its return to the catalogues is most welcome. The programme is centred around Glazunov’s Violin Concerto, itself a real rarity in the concert hall; but we are also given two other very substantial romantic works for violin and orchestra including a piece by Tchaikovsky which makes an enterprising alternative to his violin concerto, and a couple of unusual encores. Indeed, so unusual that this recording seems to be the only current representation in the catalogue of the Ysayë transcription of the Saint-Saëns Caprice. This was the only item in the collection which drew less than whole-hearted endorsement from the Penguin Guide authors, who found it “a little effortful”. Otherwise they praised her “rich-toned romanticism” and “passionate commitment”, awarding the original Pickwick release three stars. The disc remains highly recommendable. 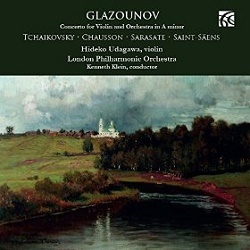 The Glazunov is inevitably regarded as one of the ‘second flight’ of violin concertos, not up there with the ubiquitously popular Brahms, Tchaikovsky, Beethoven and Mendelssohn but still worthy of an occasional airing in concert and a place in a CD collection. As such it has garnered a fairly good clutch of readings, but Hideko Udagawa is up there with the best of them and certainly ahead of some rivals whose performances are dutiful rather than engaged. The recording quality is decidedly superior to that supplied to some of the more firmly established artists, such as Jascha Heifetz (review review review), who have committed the work to disc. As for the Chausson Poème it hardly lacks for alternative readings, but it is well served here. The other rarer items on the disc make for interesting discoveries for those prepared to venture marginally off the beaten track. It is enterprising to include Glazunov’s orchestration of the Tchaikovsky pieces, and one is surprised that they are not performed or recorded more often. For those seeking to add the Glazunov concerto to their collections, and not wishing to duplicate other better-known works which they may already have on their shelves, this reissue is highly recommendable. The soloist has always shown a commendable willingness to explore the fringes of the repertoire – her more recent recordings have included a coupling of concertos by Khachaturian and Liapunov – and she brings a warmth and strength to her playing which is a real pleasure to hear.